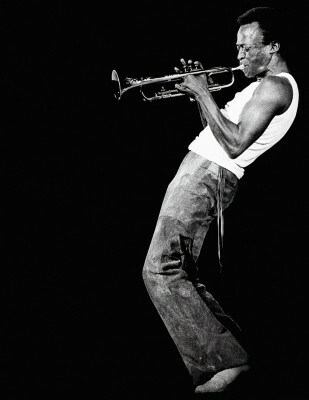 Miles Davis is still one of the most influential figures in jazz, even after more than twenty years since his death (1991). On what would have been his 88th birthday on May 26, a section of 77th Street in New York City where he lived and composed some of his most memorable music was renamed Miles Davis Way. In Seattle on May 24, a quintet of Seattle musicians gathered on stage at Tula’s to play some of the music composed and played by Miles Davis and members of the groups he led, including Wayne Shorter and Herbie Hancock. Playing for a full house of enthusiastic fans, trumpet player Thomas Marriott led a quintet with Mark Taylor, saxophones, Darrell Grant, piano, Evan Flory-Barnes, bass and Matt Jorgensen on drums. The music reflected several distinct periods and styles of Miles Davis multi-faceted career as trumpet player, bandleader and catalyst. The two sets of music were recorded for broadcast and highlights from the second annual “Miles Night” at Tula’s will air on Jazz Northwest, Sunday, June 1 at 2 PM Pacific on 88.5 KPLU, and stream at kplu.org. The program will also be available as a podcast. Jazz Northwest is recorded and produced by Jim Wilke exclusively for 88.5 KPLU. “Icons Amoung Us,” the documentary jazz film created by local filmmakers Lars Larson and B. Dahlia is airing tonight at 9:00pm on KCTS Channel 9 in Seattle. Icons Among Us: jazz in the present tense :90 Trailer from Paradigm Studio on Vimeo. The Bellevue Jazz Festival starts tomorrow (Wednesday, May 28) … here is the full schedule. Mercurial guitarist Bill Frisell has been popping up all over the place lately, but not often with Beautiful Dreamers, which plays the Bellevue Jazz Festival Saturday, May 31. If you’ve never heard this minimalist chamber trio — with Seattle’s Eyvind Kang, viola, and Rudy Royston, drums — do so. These three guys get more big, unusual — and playful — sounds out of three instruments than anyone since guitarist Jim Hall teamed up with clarinetist Jimmy Giuffre trombonist Bob Brookmeyer in the late ’50s. The comparison is not accidental. As in the earlier outfit, the trio members alternate rhythm, harmony and melody duties, interacting in surprising ways — and in an array of genres. One minute Frisell and Kang share a lickety-split unison on the vintage swing riff “Bugle Boy,” the next, Kang dives under Frisell’s melody on Stephen Foster’s “Beautiful Dreamer” (the trio’s namesake) with dark scales that sound “wrong” till you realize he’s prefiguring the next chord, which Frisell handily resolves. On the classic pop ballad by Little Anthony and the Imperials, “Goin’ Out of My Head” the trio weaves an orchestral tapestry that makes it seem impossible this is only a trio. 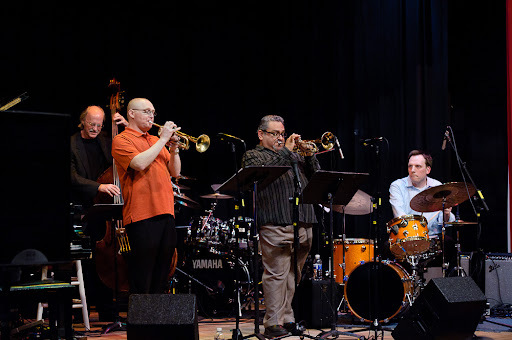 This week on Jazz Northwest (Sundays at 2 on 88.5 KPLU), we’ll preview the featured artists at The Bellevue Jazz Festival, including The East-West Trumpet Summit with Ray Vega and Thomas Marriott, Carlos Cascante y su Tumbao, Poncho Sanchez, and Bill Frisell’s Beautiful Dreamers. The festival also include many free performances in downtown Bellevue Wednesday through Sunday. Also on this week’s Jazz Northwest are a sneak peek (listen) to Diane Schuur’s new CD to be released next month, pianist Rick Mandyck, Danny Kolke’s Trio + Pete Christlieb and the Bothell HS Jazz Band from KPLU’s School of Jazz Vol.10! Jazz Northwest is recorded and produced by Jim Wilke, exclusively for 88.5 KPLU and is broadcast every Sunday afternoon at 2 PM Pacific. It is also streamed at kplu.org and available as a podcast. BOXLEY’S: Jennifer Kienzle – Seattle Kobe Vocalist Winner! ROYAL ROOM: Whitney James / Marriot Harper Inc.
Whitney James & Company with Bill Anschell on piano, Geoff Harper on bass, D’Vonne Lewis on drums, LaRue Nickeslon on guitar, Jeremy Powell on tenor saxophone. For their show at The Royal Room James will be presenting some classic jazz standards along with what she calls “new standards” modern popular music that has been flipped on its head, reharmonized and jazz-i-fied. Join us for a truly inspiring and energetic evening of jazz with this new voice in jazz music. Vocalist Whitney James studied musical theater and opera before falling in love with jazz at a young age, and her theatrical background has served her well. James was born in Chicago but grew up in Los Gatos, CA and moved to Seattle to attend Cornish College of the Arts where she received her Bachelor’s Degree in Music. Her debut CD The Nature of Love spent 16 weeks on the National Jazz Charts and received critical acclaim from US and International Jazz Press. In 2012, Whitney was one of thirteen jazz musicians heralded as “Legends in the Making” and was featured on Marian McPartland’s Piano Jazz: Rising Stars on NPR radio hosted by Jon Weber. To hear Whitney sing and read more about her, visit www.whitneyjames.com . Marriot Harper Inc. opens the night, with Tom Marriott on trumpet, Geoff Harper on bass, Steve Moore on keys/trombone and Mike Stone on drums. 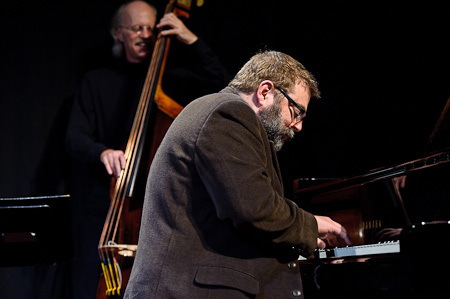 Of the many distinctive jazz musicians who came up on Seattle’s fertile 1980s scene, pianist Dave Peck — who’s got two nights at Tula’s Friday and Saturday, May 16-17 — has distinguished himself by continually refining his craft. Firmly ensconced in the lyrical school running from Bill Evans to Keith Jarrett — and sharing their technical mastery, which makes lickety-split execution seem effortless — Peck plays pretty and swings, too, digging deeply for the sweetest notes and coming back up with surging, honest emotions. Peck worked as a sideman for a long time, most notably with the late saxophonist Bud Shank, who once put on a whole concert and then recorded an album devoted to Peck’s considerably attractive compositions, work that tends to highlight the pastoral nature of our surroundings here in the Northwest. from Earshot Jazz: The five members of this quintet come from very different backgrounds: classically trained, jazz schooled, refusal of any. The common devotion is to one of spontaneously composed sonic creations. What we play displays an understanding of music in all its depths and surfaces, writes contrabass clarinetist Paul Hoskin, performing on the bill. For harpist Carol Levin it’s an extension on recent work at Amsterdam’s Dutch Impro Academy. She performs on both electric and acoustic harp with effects. Three clarinets (Beth Fleenor, Jenny Ziefel, Paul Hoskin) and two harps (Carol Levin, Monica Schley) create this improvised music night at the Chapel Performance Space. Admission is $5-$15, sliding scale.